SJVN Limited, Is Recruiting Eligible People To Various Executive Trainees Post. So Interested Can Apply For This Through Online Mode Within The Given Time Period. Kindly Do Check Out The Notification For An Accurate Information And Instructions, It's Provided Down Below. A. Number Of Vacancies And Name Of The Post. Executive Trainees →69 Vacancies, Kindly Do Check Out The Image Below For Name Of The Discipline, Educational Qualifications And More. B. Eligible Criteria For Executive Trainees In SJVN Recruitment 2019. Age Limit →Upper Age Limit is 30 years as on closing date of advertisement. 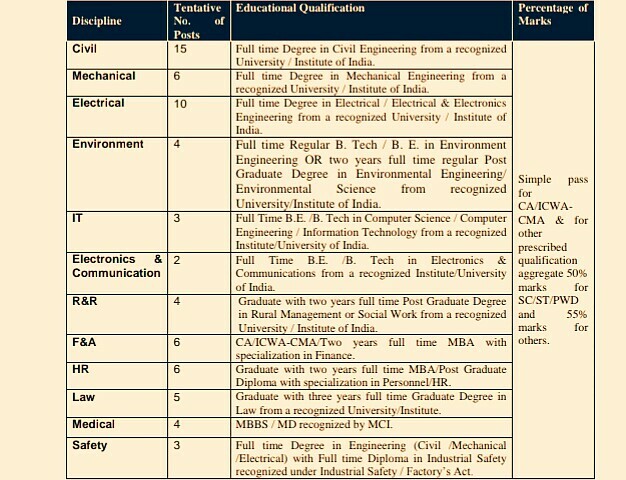 Educational Qualifications →Check Out The Image Above. Mode Of Examination/Selection Process →Computer Based Examination/Group Discussion And Personal Interview. Exam Centre →The written test will be held in the test centers of following cities: 1) Delhi/ NOIDA/ Gurugram/ Delhi NCR 2) Himachal Pradesh: Baddi/ Bilaspur/ Hamirpur/ Kangra/ Kullu/ Mandi/ Palampur/ Shimla/ Solan 3) Dehradun 4) Chandigarh/ Mohali. Candidates have to choose any two test centers/cities as preference -1 and preference-2 as Test Center and no change in any circumstance will be considered subsequently. However, SJVN reserves the right to add/delete any Centre and allocate any Centre to the candidates. Online Application/Examination Fee →₹600 + GET For Unreserved Candidates And No Fee For Other Reserved Candidates. Last Date For Online Application Form Submission →8th Of April, 2019. For More Info →The Official Website Of SJVN Limited. Now Apply For SJVN Recruitment 2019 Apply Online For Executive Trainees.